On the American Armistice Day, November 11, 1927, the United States and Canada came together at Arlington Cemetery outside of Washington DC to dedicate a monument to Americans who served in the Canadian Expeditionary Force (CEF), Canada’s First World War army. The representatives that day remarked upon a feature of their shared history that was not well understood and appreciated at the time, or since. Upon closer inspection, they were members of the RCAF and RAF, and stories of American members of those forces in World War II are fairly well known. What I found at Lijssenthoek, however, was not known at all. Twenty-two of its approximately 477 Canadian burials are actually American citizens, and another 23 list parents and wives with American addresses as next of kin. All lie beneath similar gravestones that denote them only as members of Canadian forces and ostensibly of Canadian citizenship. 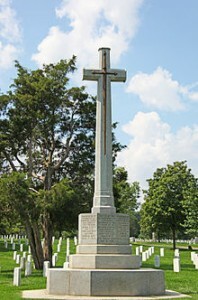 They are among approximately 2,700 similar World War I American or American-related burials or named memorials in Commonwealth War Graves Commission (CWGC) cemeteries worldwide (including approximately 250 within Canada). The who and why of their story follows the shared history of the two countries from the US Civil War, at least, into the early 20th century. The 1900 U.S. census included 1.2 million Canadian immigrants. In the other direction, an estimated 588,000 Americans had moved to Canada between the Civil War and 1910. Most were driven back and forth by perceived economic opportunity that was sometimes promoted by active recruitment of the citizens of one country to the industry or agriculture of the other country. As a result, families and their breadwinners were often split on both sides of the border. Added to this fluid movement were the comings and goings of British citizens to their fellow Commonwealth nation or to their former colony. Many of those in this mix were brought to war by the cruelty of the German invasion of Belgium in 1914, others more simply by the need for employment. Citizens of all three countries came from wherever they resided at the moment to enlist in the Canadian war effort. As reflected in the figures given to Col. H.C. Osborne in 1927, more than 10,000 of those coming from the United States were probably British subjects or Canadian citizens (as defined by the Canadian Immigration Act of 1910). But for the 35,612 of them who were American citizens by birth, (those born in Alaska were deemed American citizens starting in 1924), the act of crossing the border to fight with Canada and the Commonwealth could lead to the loss of their American citizenship. For that reason, many of the first Americans to enlist hid their citizenship from Canadian recruiters, who, in turn, knew not to press the matter. Caption: It was not legal to recruit Americans into the Canadian Expeditionary Force within the United States. But recruiting posters and flyers were plentiful, especially along the U.S. / Canadian border. Legal issues for these Americans would not be fully resolved in their favor until after the war, but, as the conflict progressed in the years before the American declaration in 1917, American movement to Canada became more open, organized and accepted, though often on tenterhooks. 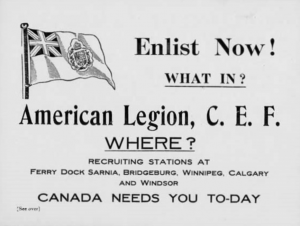 The 97th Battalion of the CEF, as an example, was created specifically as the American Legion and other CEF battalions from across Canada fell under that name until Germany complained. If America did not have the courage to declare itself in the war, it said, its name should not be in the game. At the quiet request of the United States, Canada dropped the name officially, though it would continue to be used anecdotally. Whoever these men were and wherever they came from, the tens of thousands of those who were American citizens fought with distinction, as did Canada in the war. When the U.S. finally declared itself in 1917, most stayed with their Canadian brethren and with the concurrence of their own government. By 1920, they were fully welcomed back into their own country as American citizens in good standing. The dead among them were legally welcomed in American war cemeteries (though they were bound by policy to remain in CWGC cemeteries), and the Cross of Sacrifice of the Commonwealth Forces was dedicated at Arlington. I was privileged to return to Lijssenthoek over the American Memorial Day weekend earlier this year to join the ceremonies and tell a few stories. Here are some of the people we remembered: Henry Augustus Coit was born in Concord, Massachusetts to a distinguished American family. The only American member of the Princess Patricia Light Infantry, he fought in the trenches of Ypres though he died after being hit by a truck. Perry Claggett was a child of Philadelphia, Missouri who moved to Canada for employment at age 18 and died as a sapper with the 9th Canadian Railway. James Thorpe was born in Cedar Rapids, Iowa but became a lumberman in Kamloops, BC and died in the Canadian Machine Gun Corps. Just three stories in a list of thousands about Americans who were Canadians, but, more important, were citizens of two countries with a common border who fought together in common cause. Chris Dickon is the author of Americans at War in Foreign Forces and The Foreign Burial of American War Dead. Library and Archives Canada RG 24, vol. 6561, Col. H.C. Osborne, secy, Imperial War Graves Commission, report for the minister (Americans in Canadian Forces), 14 October 1927. Danny Jenkins, “British North Americans who fought in the American Civil War, 1861-1865,”(Thesis, University of Ottawa, 1993), 21. Thanks for this, but in one respect you were mistaken. Many Americans served in the PPCLI. The most notable was Sgt Mullin who won the Victoria Cross at Passchendaele. There were many others. I will be off shortly to retrace the route of the Patricias during the war but when I return I can provide an at least partial list that includes one American that left his published memoirs of his time in the Patricias. Terry Loveridge, PPCLI (Ret’d) and member of the Company of Military Historians. I can forward the list in Word if you’d like.